CINCINNATI -- The Court Street Business District is getting a facelift, thanks to the Kroger Co.’s Court and Walnut store, now under construction. In the process, some veteran Court Street businesses are getting phased out. 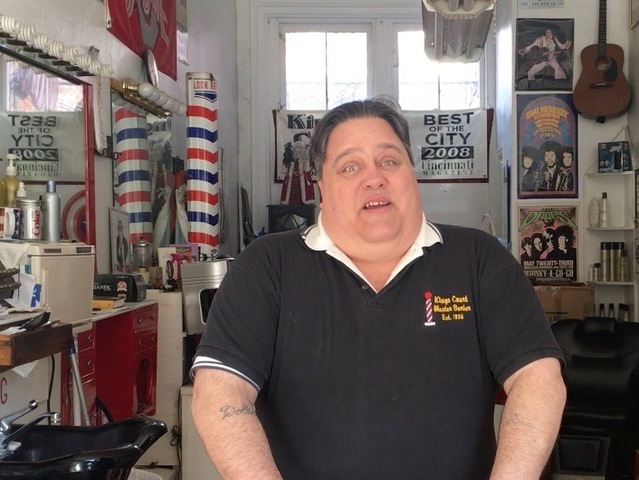 “We really thought we were helping carry this street in its down days,” said Russell Hurley, owner of the Kings Court Master Barber shop at 44 E. Court Street. He’s owned the business for 12 years. But the Cincinnati Center City Development Corp. has a new plan for the building that doesn’t include him. Hurley isn’t the only departure. Across the street, Avril-Bleh Sandwich Shop has closed its doors, its proprietor opting for stay-at-home motherhood after the business got a 15 percent rent hike. The Downtown Food Shop closed last month. Katy’s Nails and a Subway sandwich shop have also been told their leases will not be renewed. Hurley said the buildings they occupy will be renovated for luxury housing and new commercial tenants. 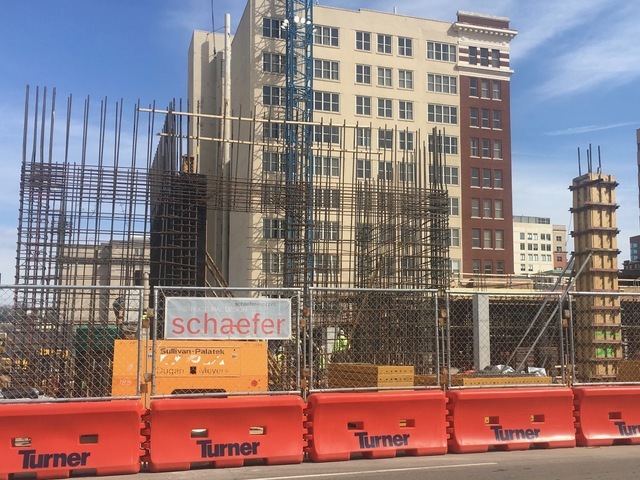 One empty lot that’s getting about $90 million in new investment is the northeast corner at Court and Walnut, a former parking lot that will house an 18-story residential tower and 45,000-square-foot Kroger grocery. The footprint of the new store is taking shape, with rebar and support columns rising from the site. General contractor Turner Construction has moved its project management office into a three-story building across the street. A real estate company affiliated with 3CDC purchased several buildings along Court Street a few years before the Kroger project was announced. It’s been nudging tenants out of the buildings since last summer. “We are working on a plan for the area, which we’ll be ready to share in a month or two,” spokesman Joe Rudemiller said. Improving the business district was a stated goal of the Kroger project from the beginning, as the streets adjacent to the grocery chain’s corporate headquarters have long suffered from a lack of investment. “We concur with 3CDC that the Court Street corridor has kind of become a dead zone,” apartment developer Rick Kimbler told WCPO last June. Kimbler’s NorthPointe Properties is one of three partners in the 139-unit apartment tower at Court and Walnut. Meat shop owner Len Bleh said the district will improve with 3CDC’s investment. 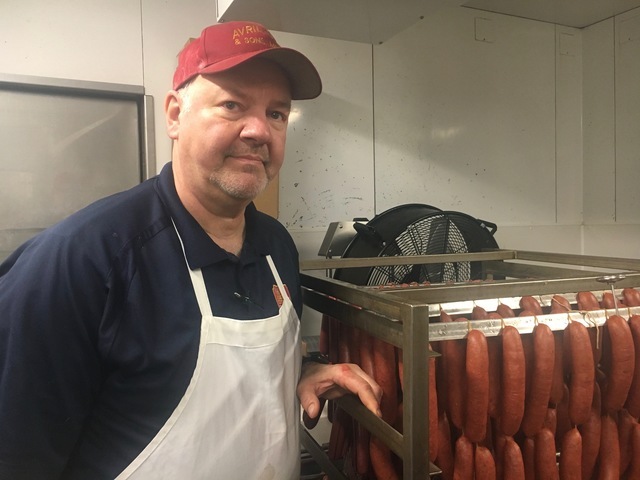 His company is growing as a custom provider of hot dogs and sausages to Christian Moerlein Lager House and the Senate restaurant on Vine Street, a 3CDC tenant. Bleh owns his own space, but might be interested in leasing adjacent space for an expansion to accommodate his growing restaurant customers. While some Court Street tenants are leaving, others are arriving. Great Clips has signed a lease for a 2,800-square-foot store in the former Servatii’s space on Court and Walnut’s Southwest corner. The space, which is not controlled by 3CDC, was previously leased by a Memphis, Tennessee-based chicken restaurant. But that deal fell through, allowing Great Clips to claim the corner, said Patrick Metz, sales associate for the real estate brokerage, NAI Bergman. Just down the street, Kroger vendor Empire Bakery has opened a non-retail innovation center at 19 E. Court St. The Virginia-based company declined to comment on its plans for the space. Hurley agrees the project will revive the neighborhood. That’s why he wanted to stay. His barbershop has operated in the same location since 1936, winning Best of Cincinnati awards in six of the last seven years. But 3CDC told him the building must be cleared for a top-to-bottom renovation that will end with his space combined with a nail salon next door. They’ve offered a new space at 1430 Race St., across from Taft Ale House. He’s hoping to relocate by the end of the month, in time for Opening Day.